-to overcome obstacles and travel from A to B. 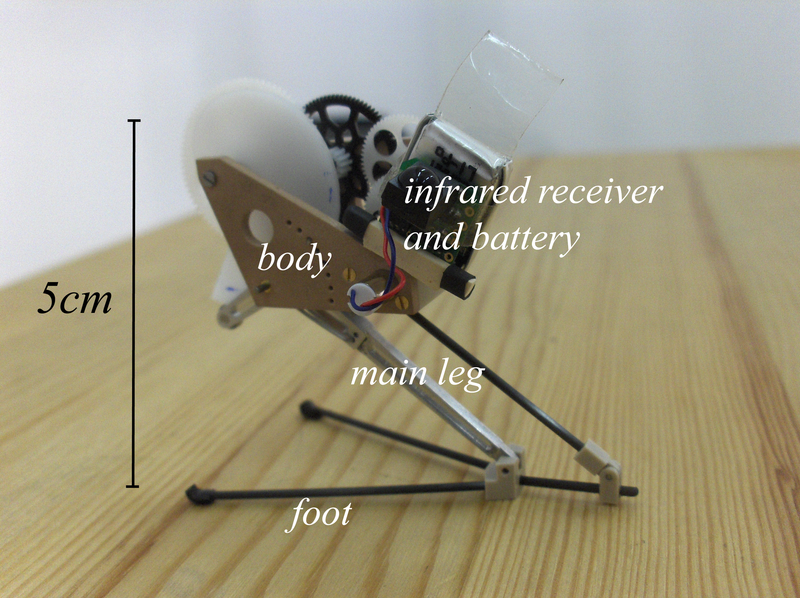 It can be applied in miniature robotics as a very versatile and easy to use locomotion method. In this project we aim at developing a palm sized Microglider that possesses the ability to deploy from ground or walls, to then open its wings, recover from almost every position in mid-air and perform subsequent goal directed gliding. A potential source of inspiration on how to accomplish this task efficiently is nature. In the animal kingdom, many small animals are able to get into the air by jumping, fast running or by dropping down from trees. Once air-borne, they recover and stabilize passively or actively and perform goal directed aerial descent (e.g. 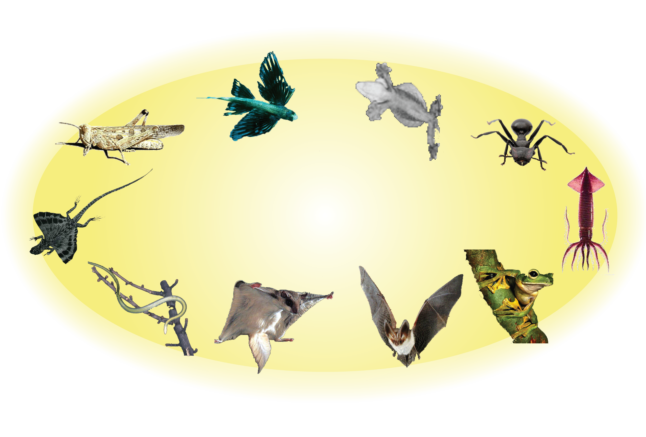 gliding frogs, flying geckos, gliding lizards, locusts, crickets, flying squirrels, gliding fish, gliding ants etc.). 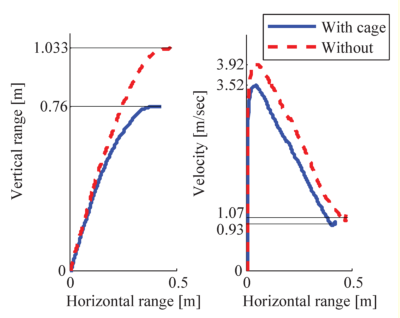 These animals do not use steady state gliding, but change their velocity and angle of attack dynamically during flight to optimize the trajectory in order to increase the gliding ratio or land on a spot. The same principles may be advantageous for small aerial robots as well. 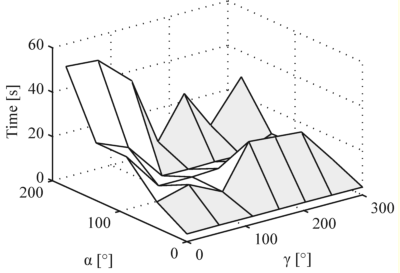 The critical issues on the path towards the realization of an efficient deploying Microglider at this scale are (i) the trade-off between passive stability, maneuverability and maximal gliding ratio, (ii) the low Reynolds number (<10'000) that leads to increased influence of boundary layer effects and renders the applicability of the conventional and well known large scale aerodynamics impossible and (iii) the control of the unsteady dynamics during recovery and flight. The work in progress addresses these aspects. Embedded mechanisms for autonomous deployment from ground or walls into the air will be considered at the next stage. 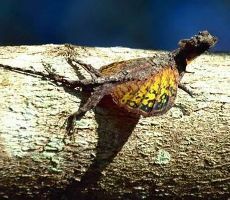 Flying Lizards can glide up to 100m distances e.g. between trees. Their gliding membrane is supported on elongated ribs. 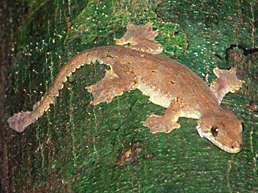 Flying Gecko. 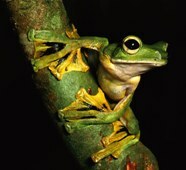 These lizards have small flaps of skin along their limbs, torso, tail, and head that catch the air and enable them to glide (flying frogs use the same principle). 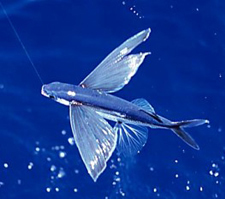 Flying Fish, there are over 50 species of fish that glide over the surface of sea, usually for up to 30-50m. 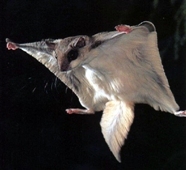 Sugar glider, There is a number of gliding mammals (flying phalangers) that on jumping, extend all four legs and stretche the loose but muscularly controlled folds of skin for controlled gliding. 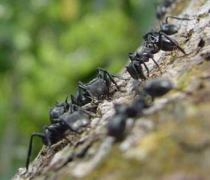 Gliding Ant, certain species of ants have a morphology that allows them for controlled gliding when they jump off trees. 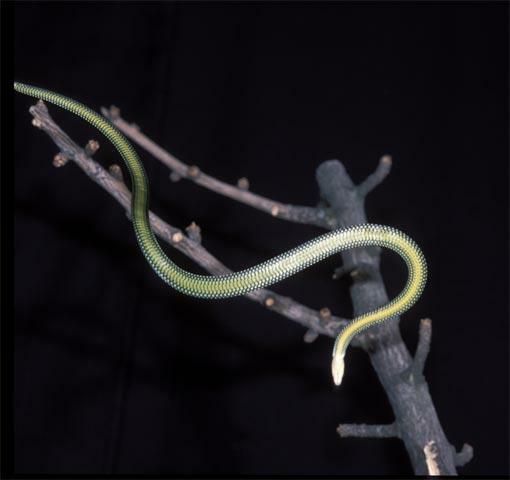 Flying Snakes can flatten their body for gliding. Some species can perform excellent glides of up to more than 100m with direction and altitude control. In nature, many animals are able to jump, upright themselves after landing and jump again. This allows them to move in unstructured and rough terrain. Based on our previously presented 7g jumping robot, we consider various mechanisms allowing it to recover and upright after landing and jump again. 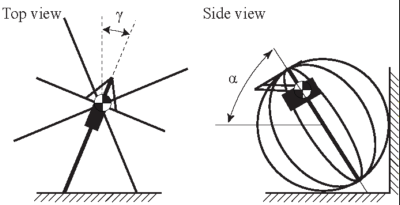 After a weighted evaluation of these different solutions, we present a spherical system with a mass of 9.8g and a diameter of 12cm that is able to jump, upright itself after landing and jump again. In order to do so autonomously, it has a control unit and sensors to detect its orientation and spring charging state. With its current configuration it can overcome obstacles of 76cm at a take-off angle of 75degree. Autonomous 9.8g jumping robot prototype capable of overcoming obstacle of up to 76cm height, upright by itself and jump again. Adding additional capabilities to the robot is always connected to a cost. It is important to consider these costs carefully and decide based on a cost analysis if it is necessary to add a capabiliy for a given application or not. Here adding the cage and electronics which allows to protect the structure on landing and passive uprighting on landing decreased the jumping height by 24.4%. This addition however is crucial to be able to move autonomously in rough terrain. Using the so called 'rescue routine', the robot is able to free itself autonomously from stuck situations facing the corner of a vertical wall with a ventral angle alpha and lateral angle gamma.This allows it to move by itself in rough terrain where obstacles appear big compared to the robot size. The biological inspiration is conceptual and on the level of biomechanical principles. Compared to the desert locust, we use the same design princples to yield very powerful jumps. These principles can be summarized as (i) being as light weight as possible, (ii) using a catapult jump, (iii) using a four bar mechanism for the legs, (iv) slowly charging an elastic element and releasing its energy using a click mechanism and finally (v) jumping without the need to control the attidute, protect the mechanism in a cage structure and upright on landing to jump again. 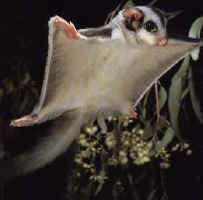 It can jump a height of up to 76cm at a take-off angle of 75degrees. The take-off angle, jumping height and ground force profile can be adjusted, depending on the environment the robot is moving in. Jumping can be a very efficient mode of locomotion for small robots to overcome large obstacles and travel in natural, rough terrain. 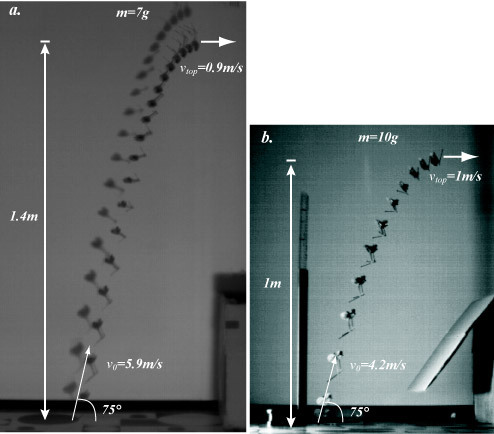 As the second step towards the realization of the the Self Deploying Microglider, we present the development and characterization of a novel 5cm, 7g jumping robot. 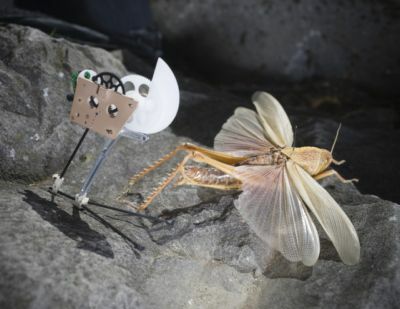 It can jump obstacles as high as more than 24 times its own size and outperforms existing jumping robots with respect to jump height per weight and jump height per size. 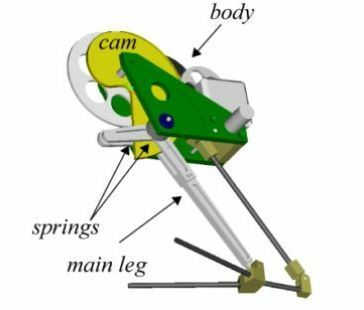 It employs elastic elements in a four bar linkage leg system to allow for very powerful jumps and adjustment of jumping force, take off angle and force profile during the acceleration phase. of up to 1.4m height. a. Jumping trajectory of the prototype without and b. with payload. As a first step towards the exploration of gliding as an alternative or complementary locomotion principle in miniature robotics, we developed a 1.5g ultra light weight microglider. It is equipped with sensors and electronics to achieve phototaxis (flying towards the light), which can be seen as a minimal level of control autonomy. 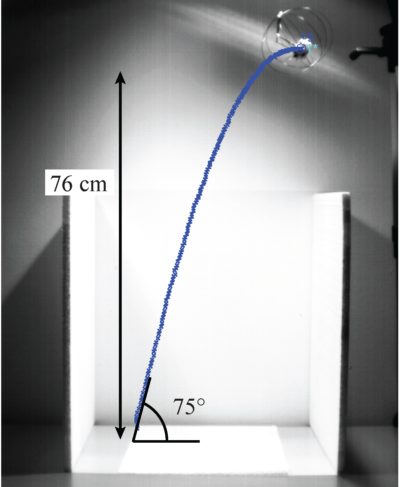 To characterize autonomous operation of this robot, we developed an experimental setup consisting of a launching device and a light source positioned 1m below and 4m away with varying angles with respect to the launching direction. 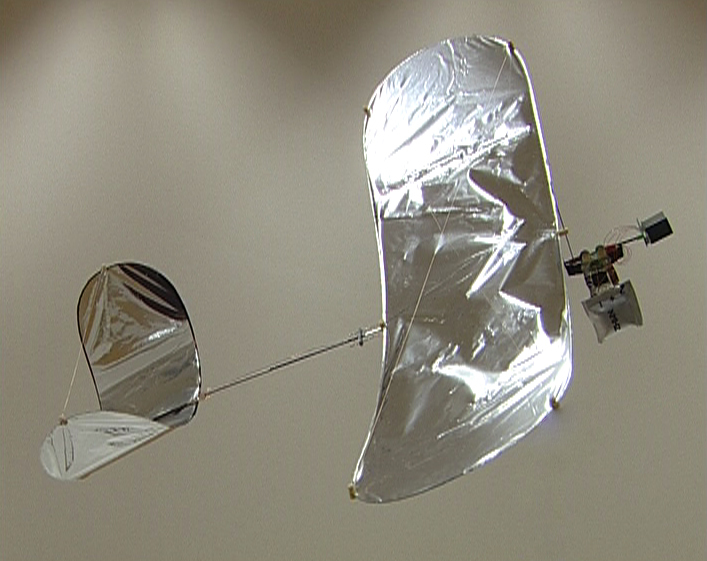 Statistical analysis of 36 autonomous flights indicate its flight and phototaxis efficiency. 0.2g SMA actuator, (a) horn, (b) spring, (c) piston, (d) SMA wire, (e) steel tube, (f) carbon fuselage, (g) frame with electrical interface to Electronic Board, (h) rudder. In order to obtain efficient gliding distances with small scale systems, special care has to be taken to achieve very low weight because the lift to drag ratio is known to naturally decrease with size, due to increasing viscous and boundary layer effects. 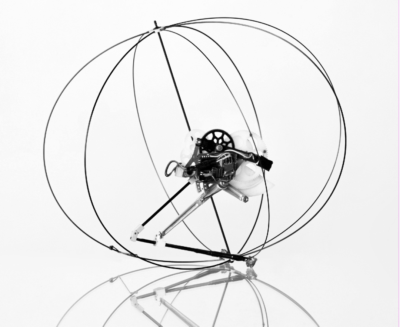 To achieve low weight and low power consumption, while maintaining an acceptable level of complexity allowing for fast prototyping, we opted for a relatively new kind of steering system. 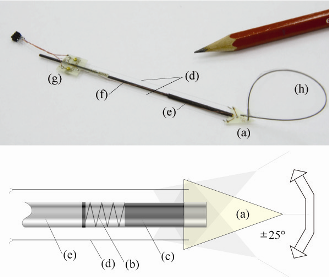 We developed a 0.2g Shape Memory Alloy (SMA) actuator (also called 'Artificial Muscles') that is harmoniously integrated into the structure of the microglider and allows for direct control of the rudder. Student contributions are an important part of our research. Motivated and ambitious individuals are encouraged to have a look on our student projects section for upcoming projects or contact me directly. More links are to be added soon! Suggestions can be emailed here.